Anthony's Science Blog » Blog Archive » Will spring snow melt in the Arctic occur earlier or later? Will spring snow melt in the Arctic occur earlier or later? I keep thinking about this question as I write up the results of our project. I posted about it once before here. On the one hand, warmer temperatures should melt snow earlier. On the other hand, warmer air holds more water, which can increase snowfall and snowpack depth. Deeper snowpacks may melt out later. 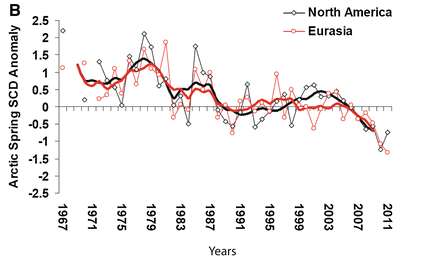 [Changing temperature and moisture regimes are] driving significant changes in the snow regime particularly during the spring season when snow cover disappeared earlier at an average rate of 3.4 days per decade over the pan-Arctic terrestrial region (excluding Greenland) during 1972–2009. 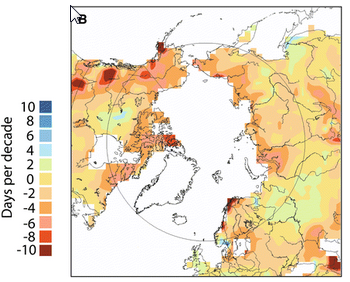 Projected changes in snow cover from Global Climate Models for the 2050 period indicate increases in maximum SWE of up to 15% over much of the Arctic, with the largest increases (15–30%) over the Siberian sector. In contrast, SCD is projected to decrease by about 10–20% over much of the Arctic, with the smallest decreases over Siberia (<10%) and the largest decreases over Alaska and northern Scandinavia (30–40%) by 2050. Despite warmer near surface atmospheric temperatures, it is found that spring melt is delayed throughout much of the North Slope due to the increased snow pack, and the growing season length is shortened. Analysis of Northern Hemisphere spring terrestrial snow cover extent (SCE) from the NOAA snow chart Climate Data Record (CDR) for the April to June period (when snow cover is mainly located over the Arctic) has revealed statistically significant reductions in May and June SCE. Successive records for the lowest June SCE have been set each year for Eurasia since 2008, and in 3 of the past 5 years for North America. Overall, it looks like spring melt will probably be earlier and has been getting earlier as of late. However, there is some disagreement in future projections about whether Northern Alaska (and perhaps other areas) will in fact see earlier snowmelt in spring. The underlying correlations that are driving the appearance of the maps above could turn around if warmer and warmer air leads to bigger and bigger snowpacks. My one personal observation here is that warm snaps in the Arctic spring can melt snow really fast so deeper snow may not in fact melt that much more slowly.